It looks trampled. Is it the only one that's damaged in any way? If it is, then I think it's a disease... coupled with the wilted tomato plant, I'm wondering if it's Verticillium wilt. Hope someone can tell you what to do about it. One thing though - I notice from all the photos you've posted that you haven't mulched your plants. I think that's probably the first thing you could do. And if you can, mulch with compost. If the dead/dying plants are due to V wilt, then they should be removed first with soil around them and put in the trash. root or lower stem damage, maybe? have you looked? possible a dog or relieved themselves on the plant? Putting compost around fresh vegetables that are close to being ready to eat is a risky deal. Compost can, at times, have bacteria that are fatal to people and animals. It's best to compost in the late fall so there is time for the bacteria to die. As far as your lettuce, are they planted in peat pots? I had some planted in the peat pots and my ground wasn't wet enough and all the moisture was sucked out and it looked a lot like this. Her lettuce did this literally overnight. One day it was fine; the next, it looked like this. I doubt whether planting conditions affected this lettuce, esp. since the lettuce plants around it are unchanged. 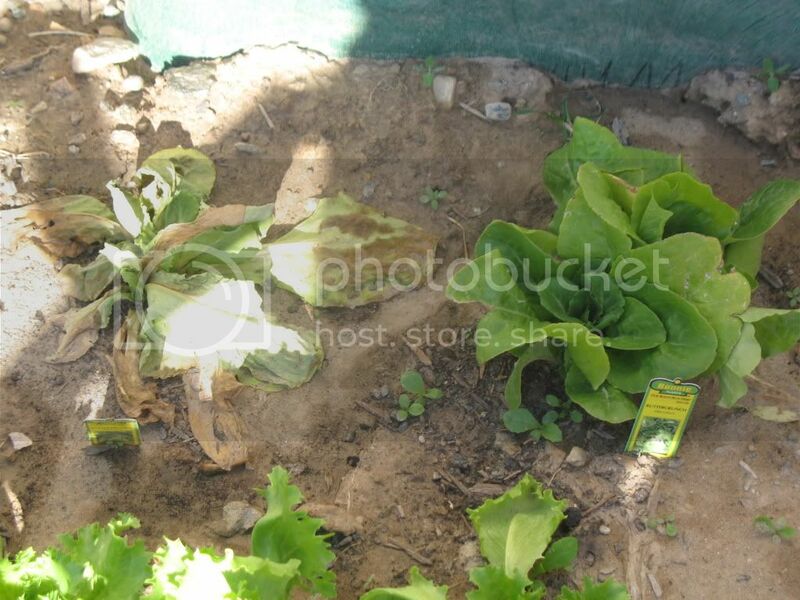 There is a history, also, of interference by next-door neighbor children with her and her children's garden plants, so this lettuce plant may have been the subject of abuse. Finished compost is not a problem when planting in the spring. I regularly mix my own finished compost with other potting mixes for seed starting and transplantation at any time of the year. But for raw, uncomposted manure, then yes definitely lay it down in the fall for overwintering. This will take care of most pathogens carried by herbivores (the only animals whose manure is safe to use in compost). Leaves Shriveled Up On Tomato Seedlings...What Happened?